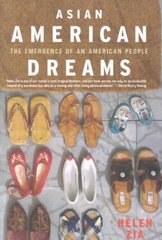 Asian American Dreams 1 Edition This groundbreaking book traces the transformation of Asian Americans from a few small, disconnected, and largely invisible ethnic groups into a self-identified racial group that is influencing every aspect of American society. It explores the events that shocked Asian Americans into motion and shaped a new consciousness. Helen Zia, the daughter of Chinese immigrants, writes as a personal witness to the dramatic changes involving Asian Americans.